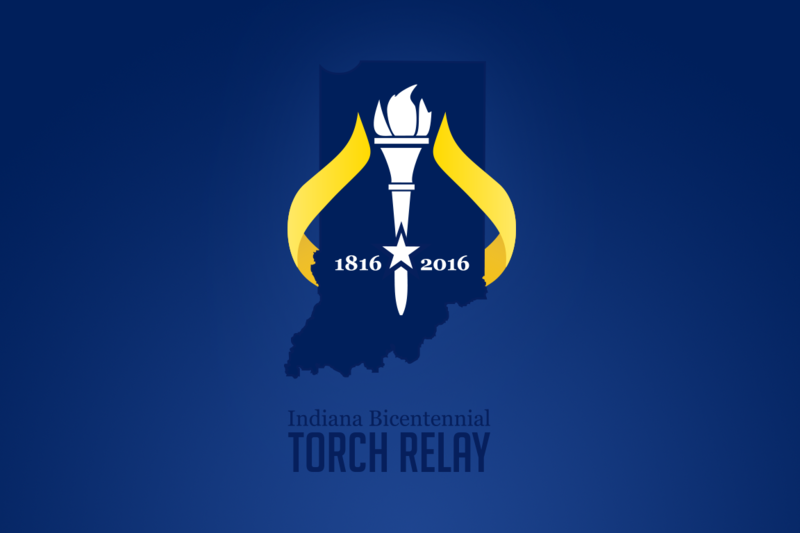 If you plan to take a visit to Tippecanoe County to watch the Bicentennial Torch Relay, you also might want to take a detour to Undercover Storage on N. 9th Street in Lafayette. Here, you can find a bison sculpture with scenes of Native American life painted on it. This sculpture is one of many across the state that celebrate Indiana’s heritage. Each is a part of a wider project: Bison-tennial, a Legacy Project for Indiana’s bicentennial. Legacy Projects are aimed at providing ways for Indiana residents to celebrate Indiana’s 200th birthday. To have a project recognized as a Legacy Project, there must be an application filled out that described the significance of the project. . For these projects to be accepted, they must be open to the public, relevant to Indiana and its 200th birthday, and be fundable and achievable, according to the application. 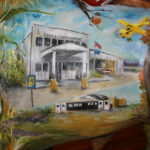 Sunny Miller was one artist for Carroll County’s bison art project. She is also the artist behind the bison at Undercover Storage. Miller said she thought it was important that the public understand the history of Indiana, especially the history 200 years ago, when Lafayette was Indian territory. Miller painted two bison for the project. One is a realistic-looking bison to be featured at Freedom Bridge, a pedestrian bridge in Delphi, Indiana. This bison, she said, is meant to evoke curiosity from visitors. She said she has heard people, including adults, ask, “Were there ever bison here?” as they view her sculpture. She wants the bison sculpture to make people learn about the history of the area, from before it was part of the state of Indiana. The other bison, at the Undercover Storage building in Lafayette, is more elaborate. It has a realistic head and mane, but the back and sides of the bison feature scenes of Native Americans. The other side of the bison features a woman grinding corn, as well as children playing and people in a canoe. 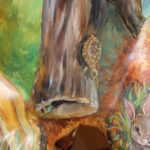 Her work is based on the paintings of George Winter, an artist who visited with Native Americans in the Lafayette area before their exodus from the area in the early 1800s. One of the scenes depicts the bank of a river with a man fishing, a woman leading a horse and another man smoking a pipe and looking thoughtful. Miller said she wanted to make sure women had a place on the bison, since many sculptures do not depict women. Miller also said that much of history is about warfare, and she wanted to depict the history of people working together, which is even more crucial. The platform the bison stands on is painted with a map of the area, and Miller said she wants to indicate where bisons can be located today. 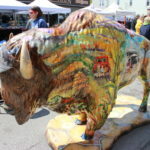 The Bison-tennial art project is put on by the Indiana Association of United Ways, and many of Indiana’s counties have participated in the festivities. The idea of the bison to paint came from the bison featured on the state’s seal. Each participating county found a sponsor or multiple sponsors, usually its local United Way, to purchase one or a few bison. 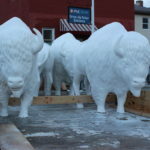 The bison are about five feet tall, life-sized, and Shellie Bellinger, one of the artists who worked with the project, said they weigh about 100 pounds. They are made of fiberglass, she continued, so they are supposed to last about 30 years. “Our art could outlast us,” Bellinger said about the project. 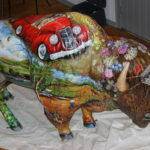 The bison were painted with acrylic paints and covered with an automotive clear coat. Bellinger said a local auto shop donated its time and materials to her project by providing the clear coat. 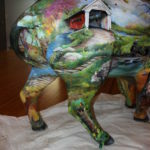 The bison were delivered to each participating county in May, and work began on painting them from there. Lake County’s bison was painted by Felix Maldonado. He said he was looking online to find a new art project and came across the bison project. He submitted his proposal for it, but then received a call from the South Shore Convention and Visitors Authority asking him to paint a bison for them, he said, so he agreed to work on the project. He said he was asked to come up with a design that would reflect the area, but not literally. Lake County, Maldonado said, is very industrial and has a lot of steel mills and factories. To showcase this, he said he used modern abstract shapes and colors. For example, he said, there is a color gradient, from fire red starting at about the bison’s neck, to orange, and finally to yellow ending about where the bison’s mane ends, halfway down its back. This is to show the steel in the mills as it is being heated. A shiny chrome back on the bison is meant to represent the finished steel. Finally, there are ground colors on the bottom of the bison. These start where the yellow color stops, and are meant to represent the beaches and dunes in Lake County. On top of those colors are greens and blues meant to show the waters in the county. This bison can be found in the Indiana Welcome Center in Hammond, Indiana. Jeff Stillson painted two bison for Elkhart County. He said he was approached with the project because of his graphic design background and the work he had previously done for the Elkhart County Fair. Elkhart County, Stillson said, wanted realistic-looking bison for its project. He said he didn’t want to paint two bison in exactly the same way, though, so he gave each bison its own unique spin. One of the bison, which he said was seen at the Elkhart County 4-H Fair, is more conventional. It has a nice, clean mane, he said. The other, he said, was made to look like a shedding buffalo, like one you might see on the plains. This one has differently-colored fur, and a “big, furry mane,” he said. This bison will come to rest in front of the Nappanee Chamber of Commerce. In DeKalb County, six people were involved in the bison art project. These artists are the Atrium artists from Auburn, Indiana. The bison assigned to them is meant to represent DeKalb County as the transportation hub of Indiana. “It evolved,” Bellinger, the leader of DeKalb County’s project, said about the idea for the bison’s design. “I took the theme and we started throwing ideas out.” Each artist then took a quadrant and a theme for their piece of the project. Bellinger said she heard about the project through word of mouth, and approached the committee before they had even sent out a call for applications. The face and eyes were one of Bellinger’s parts, and she said she worked on the eyes first to give the bison life. The top of the bison’s face features a medallion with the clock on the outside of the DeKalb County Courthouse. The rest of the bison is covered in different modes of transportation representative of DeKalb County. There are two airports, the DeKalb County Airport and the Auburn Airport, on one side of the bison. 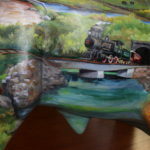 There are also two trains and a train station on the bison, and Bellinger painted a red car on the top of the bison’s mane. She painted the car on the bison so that it looks as though you are standing in it as you look from one side of the bison. Because the bison’s mane is textured, she said, it was hard to make the car look smooth. Indiana’s state flower, the peony, and the state bird, the cardinal, adorn the bison’s neck, and a covered bridge decorates its right hindquarter. 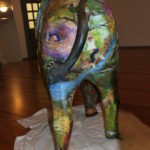 To celebrate the goals of the United Way, the artists painted a girl sitting in a tree reading, on the bison’s rump, and a boy hanging from the tree that is the bison’s tail. There is also a boy looking at a squirrel on a tree and children sitting in the bed of a truck going fishing in a farm scene. Animals also adorn the bison in various places. The bison arrive in Dekalb County to be painted. Photo provided by Shellie Bellinger. A top view of the bison. The cardinal and flowers were painted by Pat Delgrange. Photo provided by Shellie Bellinger. 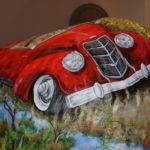 The car Bellinger painted on top of the bison. Photo provided by Shellie Bellinger. Another view of the car Bellinger painted on the bison. Photo provided by Shellie Bellinger. The back of the bison, with the boy hanging from the tree. Photo provided by Shellie Bellinger. One side of the bison shows the covered bridge and train. Photo provided by Shellie Bellinger. Rebecca Justice-Schaab painted the girl sitting in the tree reading. Photo provided by Shellie Bellinger. 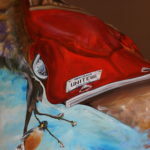 The bison’s headpiece, which Bellinger also painted. Pat Delgrange, another of the artists, painted the birds on the bison’s face. Photo provided by Shellie Bellinger. The Dekalb County Courthouse clock is featured as a medallion on the bison’s head.Photo provided by Shellie Bellinger. Farm scenes featured on the other side of the bison. Photo provided by Shellie Bellinger. Two airports adorn one side of the bison. Photo provided by Shellie Bellinger. 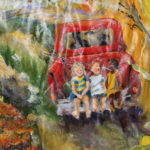 Sandy Kessler painted the children on the truck going fishing as well as the airports on the bison. Photo provided by Shellie Bellinger. A bunny is only one of the many animals featured on the bison. Photo provided by Shellie Bellinger. The Waterloo train station in Dekalb County was painted by Bellinger. Photo provided by Shellie Bellinger. 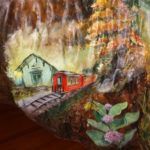 This train was painted by Toni McAlhany. Photo provided by Shellie Bellinger. 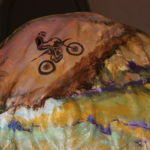 A dirtbike on the bison represents a track in the county. Photo provided by Shellie Bellinger. The bison’s stomach, with a turtle sticking up on a log. Photo provided by Shellie Bellinger. “There’s critters all over it,” Bellinger said. These include a fox, grasshoppers, a raccoon, a chicken, a rabbit, horses, and many more. 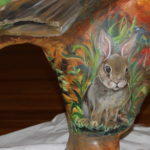 Bellinger also painted the bottom of the bison with a log with a turtle sticking up on it. 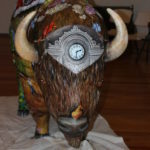 After the various pieces of the bison were included, Bellinger said a few of the artists worked to unify the styles to make the bison look cohesive. 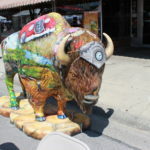 Bellinger said their finished bison was entered in the Indiana State fair, along with many of the other bison projects, where it won second place in the Judges’ Choice contest. More information about the projects can be found at: indianabisonart.com.